Tue., 1 Oct. - Sun., 13 Oct. Sat., 28 Sep. - Wed., 16 Oct.
Fri., 27 Sep. - Sun., 13 Oct.
Wed., 3 Jul. - Tue., 16 Jul. 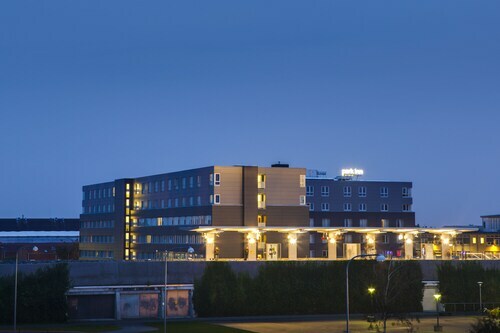 Situated near the airport, this hotel is 0.7 mi (1.1 km) from The Blue Planet Aquarium and 3 mi (4.9 km) from Bella Center. Amager Beach Park and Fields Shopping Centre are also within 3 mi (5 km). Kastrup Metro Station is 5 minutes by foot and Femoren Station is 13 minutes. 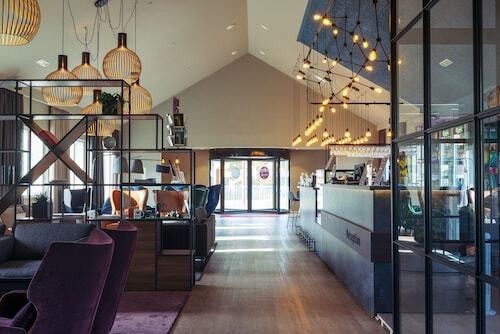 Situated near the airport, this hotel is 0.3 mi (0.5 km) from The Blue Planet Aquarium and 1.8 mi (2.9 km) from Amager Beach Park. Royal Arena and Tivoli Gardens are also within 6 mi (10 km). Kastrup Metro Station is only a 5-minute walk and Femoren Station is 16 minutes. 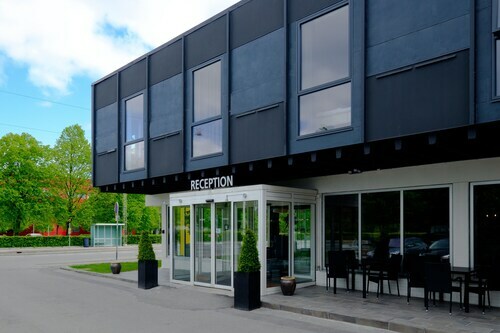 Situated near the airport, this hotel is within 3 mi (5 km) of Fields Shopping Centre, Royal Arena, and Bella Center. The Blue Planet Aquarium and Koncerthuset are also within 3 mi (5 km). Copenhagen Tarnby Station is 18 minutes by foot. 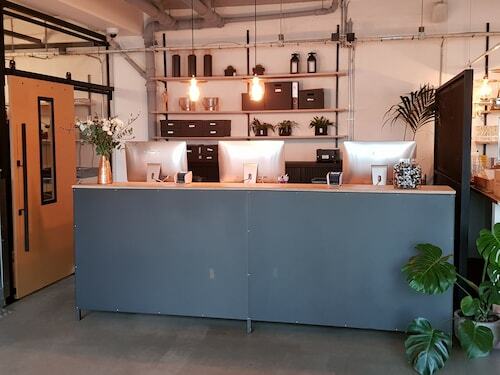 Situated near the airport, this eco-friendly hotel is 1.2 mi (1.9 km) from The Blue Planet Aquarium and 2.7 mi (4.3 km) from Bella Center. Amager Beach Park and Koncerthuset are also within 3 mi (5 km). Femoren Station is only a 2-minute walk and Amager Strand Station is 17 minutes. 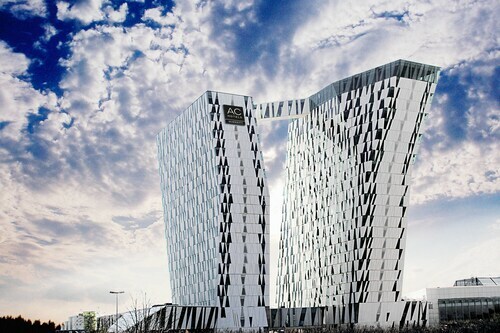 Situated in the neighborhood of Ørestad, AC Hotel by Marriott Bella Sky Copenhagen is connected to Bella Center, Scandinavia's largest conference and exhibition center. Bella Center Metro Station is in walking distance, and guests can reach Copenhagen's city center by train in 10 minutes. Question : What is the cheapest date to fly to Copenhagen? Answer : As of Apr 15th, the best day for booking to Copenhagen (CPH) is May 7th. A ticket will put you out $892, which is 48% less than the average price to book the same route. Question : How long do most people stay on their visit to Copenhagen? Answer : Of course, you're not most people, but if you were, you'd stay roughly about two weeks. Answer : Yes, you can switch your departure or arrival date. If you want to save a little money in doing so, the cheapest day to fly in April is Saturday. Having flexibility in your travel plans means you can save more, so be sure to plan ahead when possible. Question : What is the cheapest airline flying from Ottawa to Copenhagen? Answer : Air Canada is your best bet for finding that coveted low fare. They offer fares as low as $892, while rates for similar flights are as high as $7,143. Answer : The cheapest day to fly from Ottawa to Copenhagen is on Saturday. If you want to save some cash on your next trip look for flights on Saturday. Question : How much is a plane ticket to Copenhagen (CPH) from Ottawa (YOW)? Answer : They can vary anywhere from $892 to $7,143. Booking far in advance can usually help you get the cheapest ticket. Remember, the sooner you book, the better price you tend to get. Question : Which airline has the least delays from Ottawa to Copenhagen? Answer : The current leader is Air Canada with a 0% on-time rate. Don't spend more time waiting in an airport than you have to and stick with Air Canada on this route. If they are late for some reason though, the average delay is 25 minutes.